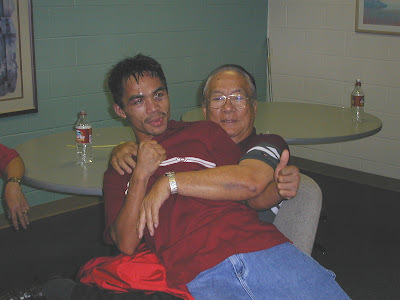 My Grandfather passed away the other day and though you may not know the man, you do know of Manny Pacquiao. He was not only the one who practically saw the raw talent in him, became his first manager, but more importantly also a father figure to our great Philippine hero. He was a loving Grandfather and I am saddened by the loss but I will now work hard to follow in his successful footsteps on the managerial and promotional front he was known for. He's brought you great joy too and you may not have known it! Thanks for all the love, prayers, support, and energy from all my loving friends and fam! Means alot! MANILA, Philippines - Manny Pacquiao carried a heavy heart to the gym and went through with his normal routine despite the death of his former business manager and mentor in life, Rodolfo “Mang Rod” Nazario, yesterday. Nazario passed away at 8:50 a.m. at the Perpetual Help Hospital in Las Piñas where he’s been confined days after celebrating his 74th birthday last Sept. 12. He died after a year-long battle with lung cancer. Nazario’s family was at the hospital when the final bell rang on the luminous figure in Philippine boxing. Pacquiao learned of Nazario’s death through a text message from a mutual friend, Gerry Garcia, who along with Moy Lainez, Lito Mondejar and Nazario formed part of the original Team Pacquiao. Pacquiao was inside his hotel suite in Baguio City, just hours after doing his morning run, when he received the sad news. At around 1 p.m., he went to the second floor of the Cooyeesan Hotel and trained in the boxing gym. Roger Fernandez, younger brother of Pacquiao’s trainer, Buboy Fernandez, said while there was a pall of gloom inside the gym, the world’s hottest boxer today went through with the usual stuff under Freddie Roach. Pacquiao said he felt like losing a family member when he spoke to The STAR at around 10 a.m.
“Nalulungkot ako sa balita (I am saddened by the news),” were the first words that came out of his mouth. He said he can’t wait to travel to Manila to be at Nazario’s wake. That could come on Sunday, his rest day. “Bababa ako (I’m coming down),” he said. Pacquiao trained at the Wild Card Gym, which Nazario owns, in Parañaque last Friday and upon hearing that Nazario was confined at the hospital, he took time to visit his former boss that same afternoon and the morning after. Little did Pacquiao know that that would be the last time he’d be with Nazario. “Akala ko malakas pa siya nung araw na ‘yun (I thought he was still strong that day),” said Pacquiao in a slow voice one could easily feel he was hurting deep inside. “Napansin ko sa ospital na lumuluha siya habang kausap ako kaya pinunasan ko pa nga ang luha niya (I noticed in the hospital that he was in tears as he talked to me. I even had to wipe them off),” said Pacquiao. He said those tears rolled down Nazario’s face for different reasons. “Baka nahihirapan na din o natutuwa siya na nandun ako (Maybe he was struggling or he was happy I was there),” Pacquiao said over the phone. “We talked about the (Miguel) Cotto fight. Sabi niya sa akin ‘kaya mo yan basta gumalaw ka lang ng gumalaw (He told me ‘you can handle him as long as you keep on moving’),’” said Pacquiao. “And he also reminded me not to be over-confident,” he added. The STAR thought it was time to hang up but Pacquiao just went on with kind words for his business manager from 1995 to 2005. It was Nazario who first brought him to the US for the breakthrough fight with Lehlo Ledwaba in 2001. “Yon nga ang huling kita ko sa kaniya. Ang sabi niya pa hindi na daw siya makakapunta sa Las Vegas sa laban kaya sa TV na lang siya manonood (That was the last time I saw him. And he told me he won’t be there for the fight and he’d just watch on TV),” he said. “Nalulungkot talaga ako dahil sa kanya ako nag-simula. Kung wala siya, wala din ako. Madami siyang pangaral na binigay sa akin (I’m sad because I started out with him. If not for him I won’t be here. I learned a lot from him),” he went on. Pacquiao said Nazario even requested him to include super-flyweight Eden Sonsona, a relative of newly crowned WBO super-flyweight champion Marvin Sonsona, to be in his Nov. 14 card with Cotto. “Gagawin ko yan (I will do that),” he said. Pacquiao was asked if he ever felt letting Nazario down. “Hindi naman siguro. Sigurado ako napasaya ko rin siya at naging proud din siya sa akin (I don’t think so. I’m sure I made him happy, too. And I made him proud of me),” he said. Last Aug. 14, Pacquiao visited Nazario at his gym for the anniversary of the boxing program “In This Corner” and on that day it was the elder who presented the 30-year-old boxer, a chess buff, a special gift. It was a rare 1856 chess set, made in Russia, and which Nazario bought in Orlando years ago for a thousand dollars. “Itatago ko ito. Kapag naglaban tayo ulit, talo ka na (I would cherish this. If we play (chess) again, you’d lose),” Pacquiao told Nazario. That rematch will have to wait for now. Your lolo was a great man. Without him, Manny might not have gotten to where he is today. Here's an article on him from the Inquirer: http://sports.inquirer.net/columns/columns/view/20090926-226999/Requiem-for-Rod-Nazario-reluctant-starmaker. I heard a lot of good things about him. He is a man full of energy. Our family will always pray.